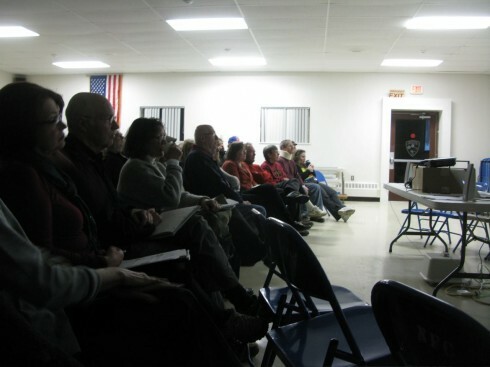 About sixty residents from Newfield and surrounding towns, including Dryden, Ithaca, Trumansburg, Spencer, Van Etten, Owego, and Apalachin, filled the Newfield Fire House, on December 8, to view Empowered: Power from the People. The Newfield Community Conversation, sponsored by the Newfield group PAUSE—People Advocating the Use of Sustainable Energy—included a reunion of many of the film’s participants and lively discussion of the making of the film, grid-tied and off-grid solar, solar leasing, wind, geothermal energy, and green building. The unique opportunity to hear diverse perspectives on planning for, installing, and living with sustainable energy was made possible through discussion with Shira Evergreen, director, Suzanne McMannis, producer, and David Means, Annie Korman, Carolyn Kreisel, Sarah Highland, as well as Lily Gershon, Tompkins County home dwellers who were featured in the film. Attendees came away with a greater awareness of the possibilities for renewable energy in Tompkins County and—so important—the determination to bring sustainable energy to our homes and communities. The film’s impact is illustrated by the response to the final questions of the evening, First question: “How many of you are working on installations or are developing new technology?” Four or five people raised their hands. Second question: “How many of you are considering installing some kind of sustainable energy system in your home or business?” About 75%-80% of the hands went up. After the movie and formal discussion, attendees took advantage of the opportunity to network and discuss technological issues and other questions with the film’s participants. This entry was posted in community, panel discussions, screenings and tagged community, education, events, screenings, tompkins county by empowered. Bookmark the permalink.